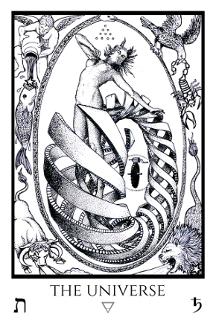 Tabula Mundi Tarot - limited first edition of the black and white version of the Major Arcana. 499 copies signed and numbered by the artist. These were created from the permanent marker line drawings before the cards were painted with india ink. The black and white version has a different signature card with the Golden Dawn color scales. It also has an extra card with the Tree of Life diagram showing the tarot paths which is not included with the color edition. Cards come in a stardust onyx band with a silver wax seal in an stardust envelope with a white key and lock design. Cards are 4x6.25 inches with rounded corners. Since the color decks come with a little white book and you may not want or need another if you are getting both, you can choose to add one via the drop down options menu.